Restoration of Cape May’s World War II Lookout Tower (Fire Control Tower No. 23) Museum and Memorial on Sunset Boulevard in Lower Township, is MAC’s latest historic restoration project. Fire Control Tower No. 23 is New Jersey’s last remaining restorable World War II tower, part of the immense Harbor Defense of the Delaware system known as Fort Miles. 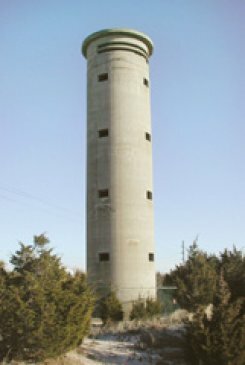 Built in 1942, the tower was one of 15 towers that helped aim batteries of coastal artillery, stretching from North Wildwood, N.J. to Bethany Beach, DE. Four were in Cape May County, N.J.—the towers located in North Wildwood and Wildwood Crest were torn down and a third tower is located inside Cape May’s Grand Hotel, Beach and Philadelphia avenues. Fire Control Tower No. 23 is on land now part of the Cape May Point State Park. The tower was listed on the New Jersey Register of Historic Places on May 29, 2003 and on the National Register on Nov. 17, 2003. Phase I of this project is set to include the following: building spiral staircases in the Tower so that the public can safely climb to the top; construction of a wooden walkway from the street to the Tower, and a deck around its base, to preserve the fragile dune environment; replacing the missing windows and doors; recreating historical details, such as the original wooden ladders, and outfitting the watch room and viewing platform at the top; installing interpretive panels along the walkway and at every level in the Tower; introducing lighting and safety alarms; and upgrading the existing parking lot across Sunset Boulevard and connecting it with a cross-walk to the Tower. MAC is planning a grand opening ceremony of the fully restored tower on Saturday, May 16, 2009. This project was helped made possible by MAC’s restoration architect, Robert Russell of Holt Morgan Russell and three agencies which have awarded MAC $1.3 million in funding for the project: the New Jersey Historic Trust, the Casino Reinvestment Development Authority and the New Jersey Department of Community Affairs. This entry was posted on Thursday, April 30th, 2009 at 4:22 pm	and is filed under Uncategorized. You can follow any responses to this entry through the RSS 2.0 feed. Both comments and pings are currently closed.